Ross AM is on 1643 Khz at 2239 Utc with SINPO 34333 at SDR Twente. Radio Happy Miner is on 1646 Khz at 2250 Utc with SINPO 34333 at SDR Twente. Zender Nachtzverver is on 1647 Khz at 2225 Utc with SINPO 34433 at SDR Twente. Dre Musketiers are on 1624 Khz at 2200 Utc with SINPO 34333 at SDR Twente. Radio Relmus is on 1655 Khz at 2152 Utc with SINPO 34333 at SDR Twente. 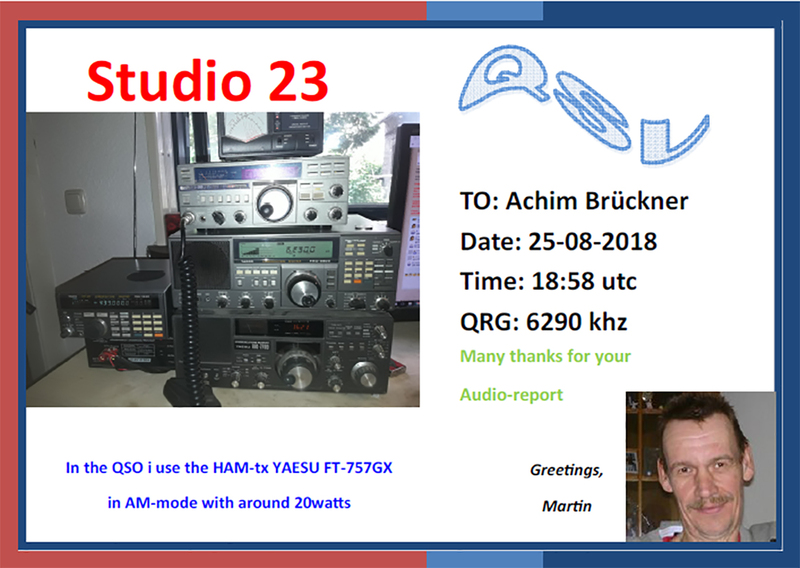 Vrije Vogel is on 1654 Khz at 2113 Utc with SINPO 34333 at SDR Twente. Zender Verona is on 1625 Khz at 2107 Utc with SINPO 34333 at SDR Twente. Laser Hot Hits is on 6205 Khz at 1410 Utc with SINPO 24322 at SDR Twente. WMR is on 5840 Khz at 1325 Utc with SINPO 34333 at SDR Twente. Radio Bluebird is on 1638 Khz at 2010 Utc with SINPO 34333 at SDR Twente. Zender Digital is on 1673 Khz at 1951 Utc with SINPO 34433 at SDR Twente. Zwarte Boer is on 1611 Khz at 1855 Utc with SINPO 34333 at SDR Twente. WMR is on 5840 Khz at 1500 Utc with SINPO 34333 at SDR Twente. Zender Pandora is on 1625 Khz at 2129 Utc with SINPO 34333 at SDR Twente. Radio Batavia is on 3935 Khz at 2100 Utc with SINPO 34333 at SDR Twente. Radio Batavia is on 4000 Khz at 2015 Utc with SINPO 34333 at SDR Twente. Zender Verona is on 1620 Khz at 1950 Utc with SINPO 34333 at SDR Twente. Zender Batavier is on 1645 Khz at 1928 Utc with SINPO 34333 at SDR Twente. Zender Torpedojager is on 1636 Khz at 1900 Utc with SINPO 34433 at SDR Twente. Mike Radio is on 3920 Khz at 1703 Utc with SINPO 34333 at SDR Twente.